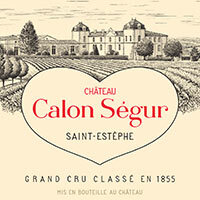 The Château Calon-Ségur 2005 is beautifully refined on the nose with blackberry, raspberry, iron rust and sage on the nose that is very focused and gains intensity in the glass. The palate is medium-bodied with firm tannins so that if feels, tightly wound with an insistent but not oppressive grip. It feels almost impenetrable on the broody, introspective finish, a wine that clearly needs another decade in bottle to mellow and become accessible. I find this more impressive more than pleasurable at the moment.